Many people assume that evolution strives resolutely forward – that the survival of the fittest means only the smartest, the strongest and the most adaptable will survive. 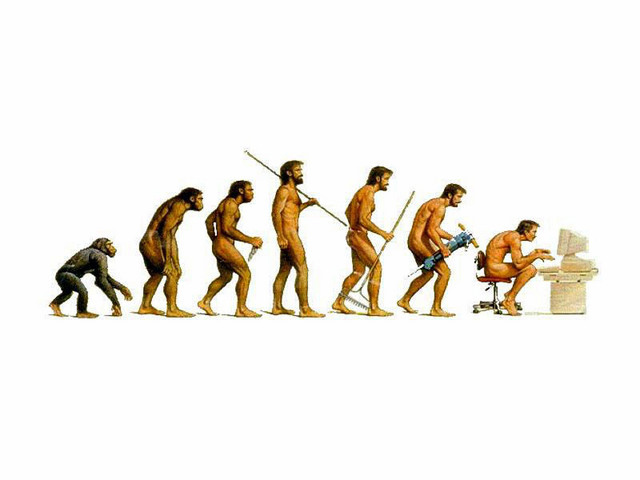 Many people also use this line of thought to place humans at the apex of this evolutionary development, placing our species above all other taxonomic orders: With a high-powered, analytical brain and an opposable thumb, we have “evolved” to overcome our animal past and are able to create cultures, civilizations and businesses that are proof of our sophistication. While studies indicate that evolution seems to have followed adaptation principles that seem random, they are really an assembly of behaviour and activities that help us cope with whatever current circumstances we face. As a metaphor, consider government tax returns – they do not change very much each year, with seemingly minor changes added on top of old requirements. Over a number of years however, they reflect the pressure of social bias and political reality. They become radically different in design and intent when viewed over longer periods of time. Evolutionary theory predicts that small changes will occur naturally and will be retained as long as they do no long-term harm to the individual or to the group. Like it or not, the same analogy holds true when looking at business procedures, processes and development. I’ve noticed in my work that many organizations both large and small evolve slowly, and do it as a living organism would, generally adding new systems on top of old. If there is no competitive or environmental pressure, they rarely undergo any kind of structural overhaul. Only when market conditions change, or competitors intrude, will companies like Microsoft or General Motors change how they are doing business. In a sense, they are microcosms of the biological world. If it works, don’t change it. If you must adapt, do it or die. In our modern world we tend to gloss over the fact that, despite millions of years of evolutionary development, humans only learned how to write less than 10,000 years ago. This development only occurred because that was the first time in human history when people were able to permanently move beyond hunting and gathering their food and could begin to live in one place and raise crops and domesticate certain animals. So forget about living in an urban environment that we call the 21st century for a bit, because in evolutionary terms we haven’t even been farmers for very long. In short, evolution hasn’t really had a chance to catch up to the enormous cultural, economic, and political upheaval humans have put themselves through in the last several thousand years. We are very much a specific kind of animal at heart, and moving from a cave to a penthouse may mask some of our animalness, but trust me – despite the body waxes – it’s still there. We are the way we are because the genes that make up our beings, the building blocks driven by our DNA, have been built up over time by combinations that simply worked well enough to survive from one generation to the next. If there was a grand plan, it got lost a long time ago. Optimization was never an inevitable outcome of evolution. Natural selection, as it turns out, is only as good as the random mutations that arise. If a mutation doesn’t kill the offspring, it will be kept to be passed along to the next generation. Mutations don’t need to give advantage as long as they don’t result in harm. Elegance and complexity are not as important as functionality. Because evolution is driven by the immediate, new genes must work with old genes and we pile new systems on top of old ones. Even human brains have not been designed from the ground up, but combine older versions of animal brains. Processes that appeared at various times in our distant past still work and have been added onto with new features. This process would be the equivalent of building a modern high performance vehicle that retained various parts from every car model ever made. In other words, start with a Model T and keep adding on features but not eliminate anything to arrive at a modern high-performance vehicle. This means there are a lot of spare parts still there that were once useful, but are no longer required. Sound like any businesses you know? So what do genetic manipulation and brain circuitry have to do with anything related to business? To me, it’s all about connections and control. One perspective to consider is this: In an average human brain you will find about 100 billion neurons and each one can potentially connect with a few thousand to as many as 100,000 other neurons (the average is actually 2,500). This results in – are you ready for this – 100 trillion to 1,000 trillion connections – or more than all the stars in the universe. Remember, however, only 25,000 genes control all of these neural connections. Think of every star in the universe being controlled by a small town in Iowa, and you get some idea of the power of both our genes and external forces that are at work shaping and defining our brains and minds. It’s one of the reasons I believe that fewer managers and more autonomous control in business makes sense. Yet, genes and neurons are only part of the explanation for why we are the way we are, in the same way that management and resources only describe essential building blocks or requirements for corporate success. Genes dictate how neurons should operate, but it turns out it is the connections between the neurons – called synapses – that are the true determiners of behaviour. Think social network. Every activity and every movement originates from, or results in, synapse formation linking neurons to each other across wide expanses of our brains. Synapse formation can be astounding to consider. For instance, it is estimated that 1.8 million synapses/second are forming between the ages of two months and two years. Equally astounding, however, are that 20 billion synapses are pruned from childhood to adolescence because of lack of use. Synapses are formed by activity or thought, are strengthened through repeated use, and are pruned if never used again. Some have called this the survival of the busiest. Use it or lose it. Many modern business organizations operate in a similar fashion. Departments often grow beyond their ability to work efficiently, so efficiency experts and managers are always on the lookout to prune non-performing individuals. Despite corporate mission and vision statements, organizations become what their people do day in and day out. Driven by their corporate values and behaviours (their corporate genes, so to speak) employees are encouraged to act in specified ways. But circumstances can cause new behaviours which, in the short term, can either be beneficial or detrimental, but certainly can change and permanently alter the way companies behave. For instance, way back when, banks were in the borrowing and lending business. Bankers made money by assessing risk and lending conservatively. Yet many of them in the U.S. first made oodles of cash (succesful adaptation), then collapsed in the middle of the first decade of this century because a select few of their traders created so called asset-backed paper (environmental reality). This paved the way for their downfall – products invented by reckless hungry traders looking to make easy commissions drove their companies to be reckless, and in some cases fail. Bottom line, even though humans have been around for at most 200,000 years or so, by evolutionary standards, this is not a lot of time for debugging. My caution – avoid your evolutionary past at your peril.